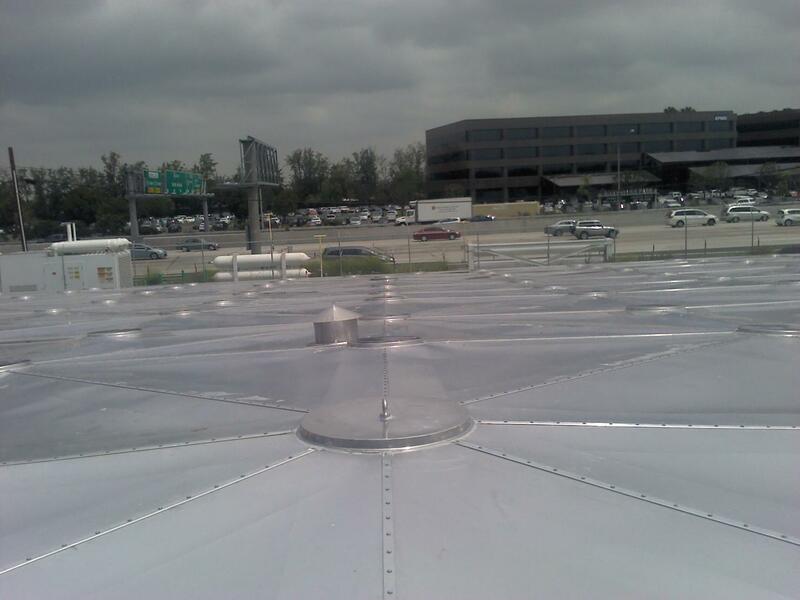 212FT x 212FT AWWA D108-10std Single Layer Geodesic Truss – Aluminum Roof Cover atop of the existing concrete reservoir in Seal Beach, California. The original approved design called for the demolition of the existing 20”x20” concrete columns which were found to be in perfect conditions (only 35-year old) and replacing them with 10” dia. sch.10 SS316 columns with rixed underside roof connections. It was creating the uplift issues that nobody has considered in the design stage, plus much higher design wind speed than 40-years ago and taking out the weight of the concrete columns, so the columns footings should have been increased. The UIG design team didn’t agree with such approach, it was very costly to the owner, demolition and removal of the existing columns with very limited crane access, so our engineers went back to the drawing board and came up with a unique Sliding Roof Support design that included sliding connections along all four concrete walls, shear walls and sliding column connections to the underside of the roof. This design will provide free horizontal displacement so no shear forces will be transferred into the concrete column. Additionally, we took a LL reduction per ASCE 7-05 from 20psf to 12psf, as there is no snow in Seal Beach, CA.